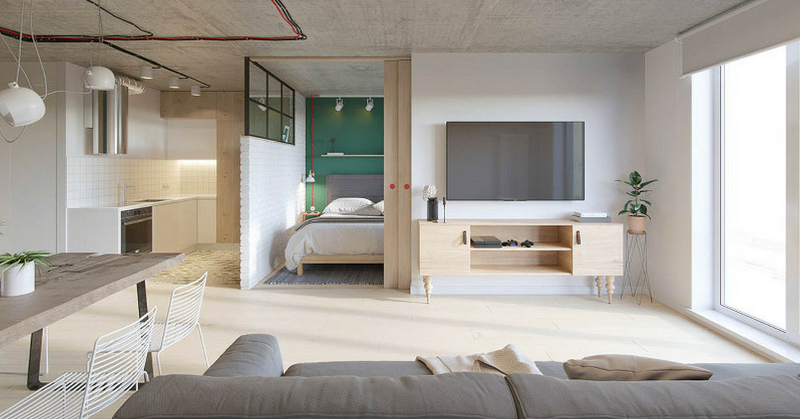 Concrete floors with wooden elements are the typical fundamentals of an industrial interior style. Hailing from Penza, Russia, this designer chose to overcome the stereotypes and embedded color variation, interesting lightings, and furnishings to appeal to a variety of its tenants. Interestingly enough, the external wiring of the light fixtures was positioned in a disorganized manner contributing to the intriguing charm of this 52-square meter apartment. Accompanying this eccentric abode are rough, wooden-framed tables paired with white metal-framed chairs; round red knobs for handles found on the open wardrobe, and its surprising choice of colors for the décor. Tiny detailing in the interior gives visitors unconventional, but surprising and awesome results. Focusing on the mixed decorative scheme of the brick walls, wooden ceilings, and contrasted patterns in the tiled floors; paired with teal bed frames, capped with Japanese windows for the divider walls from the corridor and the bedroom and brightly tiled bathroom walls all provide a refreshing ambiance. Oddly enough the whole setup goes well together projecting a general appearance of homely messiness with a well-balanced finish.